Having spent the last few years building up loyalty and mileage status with Delta, I decided to explore my reward options when flying from the USA to Rome to meet up with my parents. 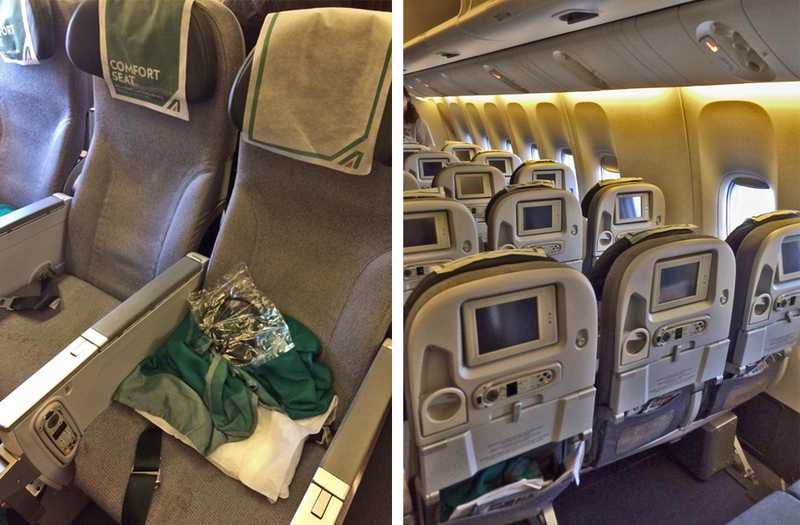 The best economy route available was with SkyTeam member, Alitalia. The flight was needed for July 2015, but I booked it back in November 2014 and was able to get a direct, roundtrip couch ticket, JFK – FCO (Rome), for only 60,000 Delta miles + $62 in taxes. An absolute steal considering a majority of the tickets for this route on the dates I needed were around $1000+. Having never flown Alitalia before, I was feeling quite happy about my success with this purchase, especially after the fare jumped up to 80,000 miles the following week. I was scheduled to fly on the 6:05pm flight out of JFK. At my time of booking, there was nothing earlier showing as available, but a few days prior to my departure date, I noticed a 4:20pm flight on the Alitalia website. I was in line to check in at the Terminal 1 Alitalia counter at 3:20pm when a member of the Alitalia JFK team came up to me and asked what flight I was on. I told him the 6:05pm but was wondering if there was any way possible I could get on the 4:20pm. He pulled me under the roped off line, told me he could be of assistance, and to follow him. I let him know I wasn’t interested in changing flights if it would incur a $200 change fee but he said he’d handle it. The next thing I know, we are at his computer, he has me on the 4:20pm flight free of charge, has allocated me an exit row seat and is escorting me through to the front of the security line so I don’t have to wait behind a huge line of people as my new flight is already boarding. AMAZING! I can’t even remember how many times I thanked him, but it was a lot. I was flying in a Boeing 777-200 ER (772). The coach (“Classica”) configuration is a 3 x 4 x 3 pattern with the seats being only 16.5 inches wide with a 30-35 inch pitch – not terrible, but definitely not amazing. My seat was honestly not too bad, but this may be because I was sitting in an exit row – seat 31J to be exact. My only complaint is that the head rest stuck out a little too far which made it feel like my neck was leaning too forward – can get quite uncomfortable a times. Other than that, I had leg rooms for days! If I wasn’t in an exit row, I have a feeling I would have been extremely cramped and displeased. Each passenger is provided a pillow, blanket and seat of headphones. Dinner was surprisingly enjoyable. There were two options, pasta and chicken. I went with chicken – always the safest bet when it comes to airline food. The portion size was impressive – chicken chunks in gravy, with roast potatoes, carrots and peas. I’m not a peas and carrots girl, but the chicken and potatoes were quite tasty. The bread roll was a winner – it was crisp and crunchy still which I loved. There was also a side of cuscus and some sort of delicious strawberry-flavored desert that I found to be the perfect ending to my dinner. After that dinner, I had high hopes for breakfast, but it was a major let down – there were no options here, it was take it or leave it. 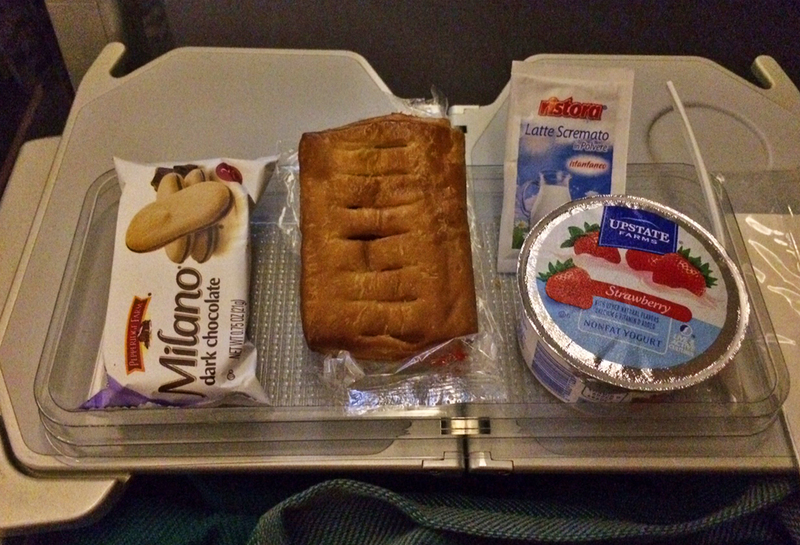 The meal consisted of a pack of two Milano dark chocolate cookies, a strawberry jam-filled pastry and a container of strawberry yogurt. I found the pastry to be a little too sweet for breakfast consumption and wish a second fruit option could have been provided. While each coach seat is fitted with a personal entertainment system, the screens are quite small and the system out-dated. I’d take small and outdated any day though over the over-head-only TVs that some long-haul flights are still only fitted with *cough* United *cough*. There was a decent selection of movies to pick from as well as some new-releases. I was able to fit in Will Smith’s new one – ‘Focus’ as well as one of my all time faves, ‘The Second Best Exotic Marigold Hotel’. Given that this is an Italian airline, you will find quite the selection of Italian movies to enjoy too if that’s your thing. After a smooth landing, I was surprised to see that the plane did not pull up at a gate. Instead, it parked in the middle of the tarmac, had all the passengers walk down a flight of stairs and then loaded us all onto multiple buses to transfer us over to the terminal. Not sure if this is a normal occurrence at Rome airport, because there were several planes across many different airlines lined up behind us ready to do the same thing! 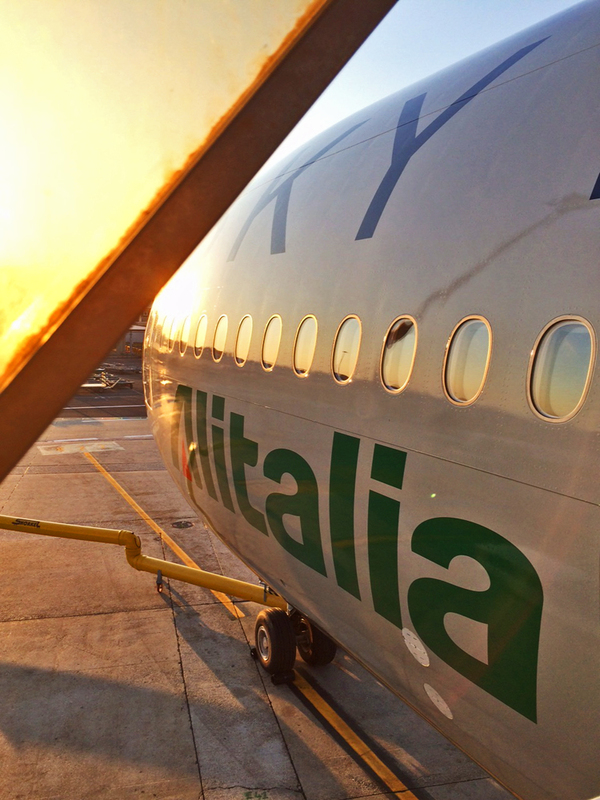 Would I fly Alitalia again – sure, if I was getting another 60,000 mile roundtrip reward deal. If I had to pay for the fare out of my own pocket, then probably not. Nice article for the traveller that want to do air travel and the idea to make there trip memorable. I agree with this 100%. 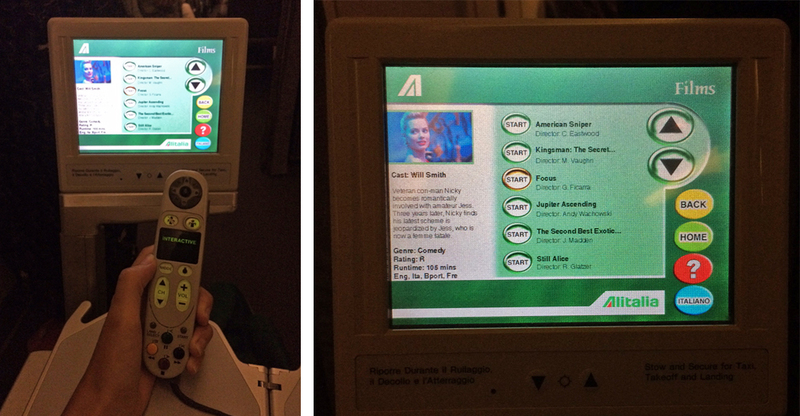 Alitalia is “ok” but not an airline I’d choose if I had others around the same price point. If it’s a reward ticket then I’m there though!